Victorian Premier joins Rabbi Chaim Herzog to join Chanukah Festivities at Parliament House. 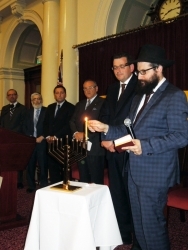 Melbourne, Australia, December 17, 2014 --(PR.com)-- On Tuesday night, the first night celebrating the Jewish Festival of Chanukah, Victorian Premier Daniel Andrews joined Rabbi Chaim Herzog and Chabad of Melbourne CBD in the lighting of the Menorah and Chanukah festivities at Parliament House in Victoria. Many dignitaries and Jewish community leaders attended the annual Chanukah celebration, including among them well known philanthropists Graham Smorgon and Joseph Gutnick, Victorian Opposition Leader Matthew Guy and the Member for Caulfield, David Southwick and his predecessor Helen Shardey, an avid supporter of Rabbi Herzog and Chabad of Melbourne CBD since its inception over 16 years ago. This year’s event was hosted in conjunction with Caulfield Hebrew Congregation and Kew Hebrew Congregation and featured a special performance by renowned Cantor Dov Farkas and guest speaker Rabbi Ralph Genende. The evening also featured the Central Shul Choir led by Didi Levin. Chabad of Melbourne CBD’s Chanukah event in the Melbourne Parliament culminated with its signature cocktail party that was widely attended by the broader community.